If you're a trance aficionado and appreciate a well-aged vintage, then you're going to really love our next release on Mondo Records. Legendary DJ/producer Darren Tate is back under one of his very first aliases as he returns under his Orion guise. Returning with a fresh remaster of his 2000 classic track 'Eternity', which has been painstakingly tweaked and brought back to life for 2018. Fans will instantly recognise that euphoric and spine tingling melody and hearing this classic again will take you back. If hearing this seminal classic wasn't enough for you, we've got none other than uplifting trance hero Daniel Kandi on remix duties who offers up a brand new take on the original. 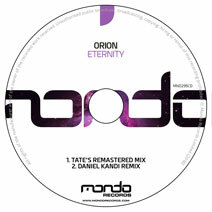 Doing what he does best, Kandi serves up a driving, euphoric and quintessential uplifting remake of 'Eternity' the trance purists are really going to appreciate. Keeping the essence of the original firmly at the heart of the mix, Kandi injects psy, driving elements throughout, while keeping the energy and emotion high. Quite simply, it's a breath taking package of one of trance finest moments - you do not want to miss this!